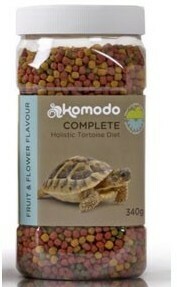 Details: Komodo complete holistic tortoise diet, is high in fibre & low in protein. It is formulated to have a calcium to phosphrous ratio of 3.5:1. Komodo diet has been extensively tialed and tested to find the variety of tastes that these tortoises love.It is available as a blend or in the 3 distinct flavours. All Komodo foods are sourced locally & produced in the UK to reduce product miles & enviromental impact.